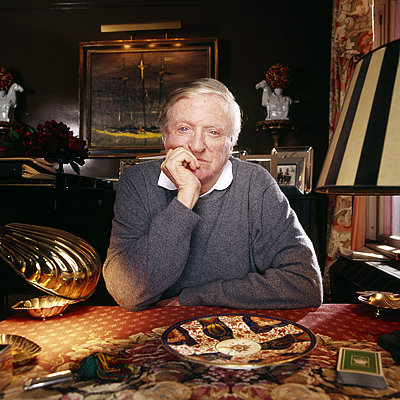 i like to tell stories : william f buckley. .i photographed william at his home in CT on april 1, 2004 for a “10 questions with _______” article for TIME magazine. .i remember very well walking around the property in the rain and how beautiful yet simple the home was. it was on the water, the style of house that screams the word home. william had a small converted garage that was now an office. i remember wanting to photograph him at his desk, but it seemed in the way and done a million times, so i kept digging for the right nook. there was a spot outside on a little path where you could get a sense of the home, the water and his daily lifestyle, but with the rain, i ended up settling on his wife’s card playing table. this i do remember quite well made his wife grumpy, she was walking around the house obviously mad about something, i only realized as we were leaving that it was us setting up that got her that way. he told us to not mind her, get what we need. i really wanted the viewer to feel like they were there with him, in a conversation about something important, or at least, something important between the two in the conversation. i didn’t know much about him, other then that his reputation was one of respect and fierce intelligence, he was quite likable in person, i found him fascinating and the kind of man i hoped to be someday yet i understood so little of even why we were there or even his points of view. looking around the home like i do at everyone’s of who they chose to frame and display pictures of, most were of his youth and the crowd he ran in. i remember seeing a picture of him on a boat as a young man, then looking closer and seeing kennedy’s in the picture too. i only got the one shot, i wanted to do another, one more for me then a magazine, but time and situation didn’t really allow that to happen. i saw another portrait of him not too long after i made mine, i really regretted my approach and wish i had done things differently or made the shot at his desk or just not done the image i did…. it was a great day though, it was one of those shoots were i knew i did my best in the moment, met a great, historic person who welcomed me into his home openly when he had no real reason too other then that i had a camera. i drove back to the city, dying to get the film handed in and then dying to peek every single frame. .william died today working at his desk, he was 82. 2 / 25 / 95. TENOROC, Lakeland, FL - 2/21/08.